Discovered by chance: Walter Schloss video on value investing (first 3 minutes). TGS Nopec ( ISIN NO0003078800) – an “Outsider” Company Buffet would buy if he could ? Disclaimer: This is not an investment advice. The author will most likely own the stock already and sell it without telling anyone as well…. 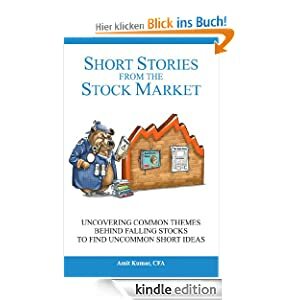 Books about short selling are few and rare so I decided to buy the Kindle version, which around 7,50 EUR is fairly cheap. The author, Amit Kumar runs an independent research firm called Artham Capital Partners and used to post occasionally on Seeking Alpha. There is also a “Manual of Ideas” interview with him to be found at Beyond Proxy. The book itself is fairly short with 167 pages, which in itself is not bad. The book covers many aspects of short selling, including some case studies from the author himself. However what is completely missing in my opinion are for instance references to existing books like the “Financial Shenanigans” classic from Howard M. Schilit. He also mentions David Einhorn’s Allied Capital Short thesis and Bill Ackman’s fight with MBIA, but again he does not reference to the book about Ackman and MBIA. Jim Chanos, the most famous short seller, is mentioned once with in the context of Enron but nowhere else. Chanos made some great presentations for instance with regard to value traps. It is also strange that in the beginning, the author explain the P/E ratio over a full page, but later on assumes quite some advanced accounting know how like knowing what Comprehensive Income is. The best parts of the book are the sections where he lists the various areas in Balance Sheets and Income statements where to look for trouble and the interview with the guy behind “Off Wall Street”. Strangely enough, in his list he doesn’t mention the Cash Flow statement as another place to detect “Shenanigans”, but he gets a special point from me for mentioning differences between Net income and Comprehensive Income as a warning sign. I would have also expected something about Chinese Reverse mergers, but it seems that the author somehow was not interested in that part of the market although it might have been one of the “Life time” short gold mines in the last few years. So overall, I have some mixed feelings about the book. Yes, it covers a lot of stuff and there are not many books out there which cover the topic. On the other hand, a lot of important stuff and sources are missing. the book could gain a lot, by referencing more to existing works of other short sellers like Chanos, Block, Bronte etc. Nevertheless, for the price offered I think the book looks like reasonable good value for investors who are generally interested in short selling, although in its current form it will be clearly not an “investment classic” anytime soon. T e fair, the author mentioned that there will be future editions of the book, so maybe he will add some of the missing parts. This is a follow-up to both, my recent post about EV/EBIT & Co as well as a discussion in a forum about how cheap German utility stocks really are. Apart from Endesa, EON and RWE really look like bargains. Even most “club Med” Italian utilities are trading at twice the EV/EBIT or Ev/EBITD levels than RWE and EON. A “mechanical” investor will say: I don’t care if they have issues, I will buy them because they are cheap. However, there is a small problem: As many people know, following the Fukushima incident, the German Government decided in 2011 to speed up the exit from nuclear power and switch off the last nuclear power plant in 2011. Funnily enough, only in 2009, they decided to extend the licenses significantly. Anyway, just switching of a nuclear power plant is not enough. Especially in a densely populated country like Germany, you don’t want to have those nuclear ruins everywhere. So the utilites are required to fully “decommission” the reactors and also all the nuclear waste. Decommissioning is expensive, for instance it is estimated for instance at currently 70 bn GBP for all UK nuclear power plant. 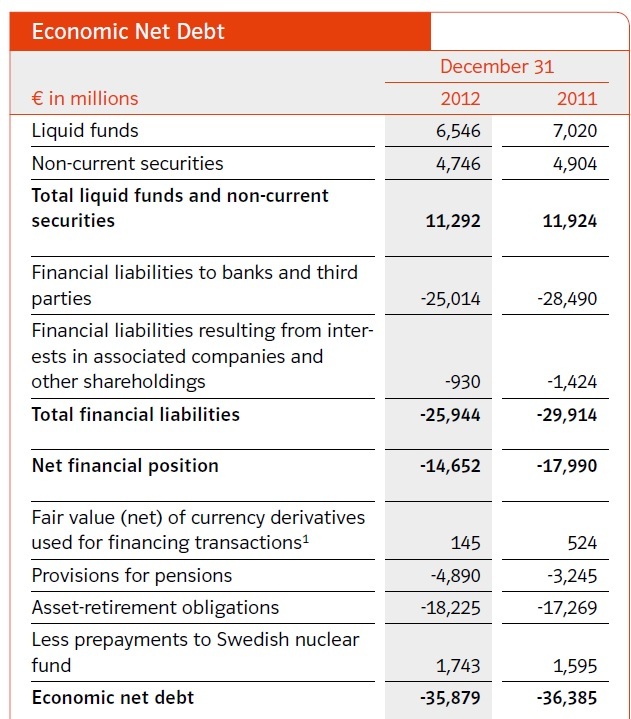 EON has 16 bn EUR of reserves on its balance sheet for the decommissioning of nuclear power plants. Those 16 bn are clearly already reserved in the balance sheet, but as they will be due in cash rather sooner than later, they should be clearly treated as debt and added to Enterprise value. However, there is a second issue with them: For some reasons, they are allowed to discount those amounts with 5% p.a. This is around 2% higher than for pension liabilities which in my opinion is already quite “optimistic”. They do not offer any hint about the duration of those liabilities, but if we assume something like 10-15, just adjusting the discount rate to pension levels would increase those reserves by 3-5 bn and reduce book value by the same amount. So all in all, net financial debt for EON more than doubles if we take into account a realistic value for the nuclear waste removal obligations. EV/EBITDA adj = 7.2 v. 4.9 unadj. EV/EBIT adj = 11.3 vs. 7.6 unadj. So adjusting for economical debt already eliminates most of the “undervaluation” compared to the peers. All things equal, a Verbund for instance which only produces “clean” power at the same valuation seems to be a much much safer bet than EON. Even quite useful metrics like EV/EBIT and EV/EBITDA can be misleading if a company has large other liabilities which turn out to be very similar to debt. If a company looks cheap under EV/EBITDA, always check if there are pensions, operating leases or in the case of utilities Decommissioning liabilities which are not captured by the standard formula. In this case, the company evene presents its “true” debt, but it is still not adequately reflected in almost every investment database. Finally a quick word on “mechanical” investment strategies: I cannot prove it, but I am pretty sure that a mechanical strategy based on EV which adjusts for “obvious” shortcomings like operating leases should perform even better than the published results from O’s et al. However It is almost impossible to backtest this. One remark: I hold the EGIS stock via the German direct broker DAB Bank. The service here is really really bad. I called them with regard to the squeeze out proceedings and they said the cannot do anything because they did not officially receive the information. They refused to look at the web site with the offer and help me in any regard. They already disappointed me more than once with trading European shares, especially French small caps. Krka, the Slovenian version of EGIS reported very good Q3 results. Interestingly enough, all the growth and profit increase came from Russia. All the other areas are not doing that well. Clearly, I was lucky to sell early after I detected my research mistake in September. Since then, the stock lost a further -16%. Since then, there was quite some news flow from the company. The company reported Q3 numbers, which overall were not very good. The reason given was that the Government delayed auctions into Q4. For the mentioned buy out offer, twice as many shares were tendered as were available. So the “acceptance” was only around 50%. So even if I would have qualified, I would have been only able to tender half of the shares. HOLDERS OF GDRs: GDR PROGRAM. If the spin-off is approved and once NewCo has been formed, NewCo is expected to consider establishing a separate GDR program in which new GDRs would be issued representing the shares of NewCo distributed to Depositary on behalf of the Company’s existing GDR holders. If decided on, the GDR program will be set by the time of the registration of the NewCo; GDRs will be unlisted. The reason that I still follow the stock is that in my opnion this is a very good way to learn more about Russian stocks and how things work there. I am not sure if this will be rewarded but I find it highly interesting (and entertaining….). The entertainment factor at Rhoen Klinikum is hard to beat. Founder Eugen Muench gave an interview yesterday, where among other stuff, he suddenly wants to use the sale proceeds from Fresenius for a share buy back at 28 EUR per share. Suprisingly, he also mentioned not to sell any shares personally. Clearly, one should be careful with everything Münch is saying. I will stick to my strategy and sell out if the “old” purchase price from the first deal is reached (22,50 EUR).